Minister Chen Wen Attends the Event of "Guizhou Culture and Tourism Going Global - the United Kingdom"
On April 1, Minister Chen Wen attended and addressed the Culture and Tourism Promotion Event--"Fascinating Guizhou: A Heaven of Myriad Mountains" hosted by Guizhou Provincial Government in London, UK. Lu Yongzheng, Vice Governor of Guizhou Provincial Government, and John McLean OBE, Head of China Relations for the Lord Mayor's Appeal and Vice Chairman of City of London IoD, made speeches respectively. Over 80 people including Lise Bertelsen, Executive Director of CBBC, Thomas Chan DL, Representative Deputy Lieutenant for the London Borough and representatives from the political, business, cultural and tourism sectors of China and the UK. Vice Governor Lu said in his speech that Guizhou is a amazing place with stunning views and colourful ethnic customs, featuring peculiar mountains, beautiful rivers, forests, villages, singing and dancing, costumes, dramas, residential buildings, local food, and bridges. 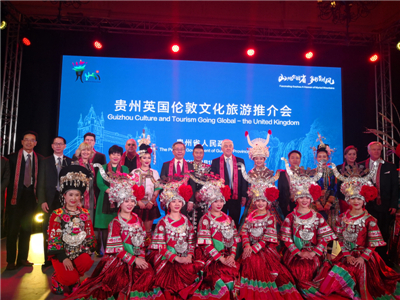 Guizhou Province is willing to take culture and tourism as a bridge, the Vice Governor said, "to work together with all circles in the UK, to seize the precious opportunities of the UK-China 'Golden Era' to engage in high-level opening-up and cooperation and grow together." 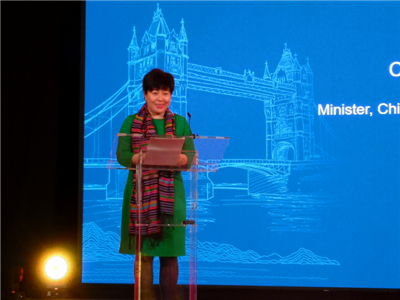 In her speech, Minister Chen Wen said that both Guizhou and the UK have rich tourism resources and diverse culture, and are keen to enhance cultural and people-to-people exchanges. She hoped that Guizhou Province would play a unique role in China-UK cultural and tourism exchanges and cooperation as a promoter of culture integration between the East and the West, a "file leader" for China-UK cooperation on green growth, and a new force in China-UK cooperation on the cultural and creative industries. 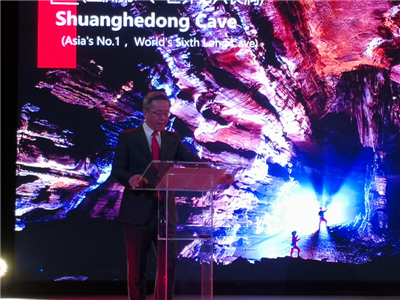 Minister Chen said, "I sincerely hope that more and more British friends will take an interest in Guizhou and find time to visit the Province. Through the window of Guizhou, you will have a comprehensive and deeper understanding on China in the new era!" 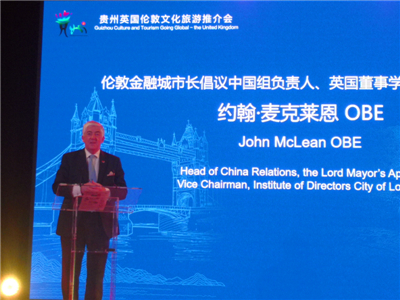 In his speech, McLean quoted John Donne, --"No man is an island, each is a piece of the continent"-- to emphasize that China and the UK should strengthen exchanges and cooperation. In 2015, President Xi's visit to the UK ushered in China-UK "Golden Era", and China-UK cooperation in the fields of economic, trade, culture and education has been flourishing, which have deepened mutual understanding and advanced China-UK "Golden Era". China is a country with innovative and entrepreneurial spirit, and China-UK cooperation is full of new opportunities. He hoped that the two sides would work closely to contribute to the culture and tourism cooperation between Guizhou and Britain. The guests also enjoyed Guizhou folk singing and dancing and appreciated the exhibitions of folk handicrafts, such as Silver Ornaments of Miao Ethnic Group and Anshun batik. Deeply impressed by the unique "Guizhou elements" and splendid "Guizhou colours", they expressed their best wishes that Guizhou and Britain would achieve new results in their cooperation.